15.04.2019 15:01:03 - Sunlight, acid or salt water: Polyvinyl chloride (PVC) can withstand practically anything and is almost indestructible. (live-PR.com) - PVC plasticizers are controversial, yet, this robust material remains one of the most frequently produced plastics alongside polypropylene and polyethylene. Demand even continues to increase: The most current and already fifth PVC market report by Ceresana expects demand to increase to about 56.2 million tonnes until 2026. PVC-U = unplasticized), which is used, for example, for packaging, pipes, and window profiles, and flexible PVC (flexible PVC-P = plasticized), which contains up to 40% plasticizer and is used for elastic products. PVC-U accounts for approximately two thirds of total demand. In 2018, pipes and conduits reached a market share of over 37%. Profiles (19.9%) and films and sheets (18.3%) follow at a distance. PVC is also used for cables, flooring, and containers. The diverse other applications include, for example, coatings, medical products such as infusion bags, shoes, and credit cards. The material PVC offers significant advantages for the production of sewage pipes: Compared to pipes made of concrete or metal, the weight of the units to be laid is drastically reduced. PVC is very resistant to corrosion and numerous chemicals. The shape of PVC pipes becomes more and more variable as well. Non-circular pipes, for example, are suitable for relining old drainage pipelines which often have non-circular shapes. In 2018, over 7 million tonnes of PVC were processed into sewage pipes. The market for potable water pipes is slightly smaller. In highly developed industrial countries in particular, legal requirements regarding potable water pipelines are often very high. A positive characteristic of PVC pipes is their resistance against UV radiation, chlorine, and ozone. With a share that is likely to exceed 60%, the construction industry will be the most important customer for PVC producers also in the years to come. Examples for the use in the construction industry are: films, cables, tubes, profiles and coverings, sheets and pipes, dowels, screws, mounting elements, and coatings. The packaging industry will rank second with almost 16%, using PVC for flexible and rigid packaging. The most important application areas in this sector are packaging films, bags and sacks as well as shrink and stretch films. The rigid packaging segment includes containers such as butter and margarine tubs, yogurt cups, bottles, boxes as well as caps. Chapter 1 provides a description and analysis of the global PVC market – including forecasts up to 2026: demand and revenues are explained for each region of the world. Furthermore, demand per product and application area is analyzed. The following PVC products are examined individually: pipes, profiles, films and sheets, cables, containers, flooring and others. The study analyzes the following application areas in detail: Flexible packaging, rigid packaging, construction, transportation, electrical and electronics, industry and others. In Chapter 2, information on demand, revenues, production, capacities, and trade is given for 46 individual countries. Demand per PVC product and application as well as demand per PVC type (rigid and flexible) are depicted as well. 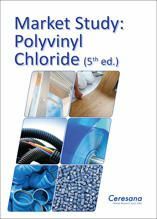 Chapter 3 provides useful profiles of the largest manufacturers of PVC – clearly arranged according to contact details, turnover, profit, product range, production sites, capacities, and profile summary. Extensive profiles of 81 manufacturers are given.